Two room suite with private deck, hot tub, kitchen and grill. 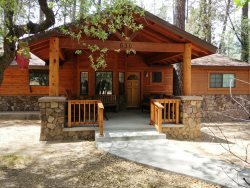 With its private deck and hot tub, fire-view woodstove and firm but plush king bed, the Chaparral Suite is one of the nicest accommodations anywhere. It is located on the far end of the log cabin at Lynx Creek Farm nestled in the hills just outside Prescott. Mementos from Bob and Jeanenne Temple's ranching days on the Rafter Cross spread in northwest Colorado decorate the walls, shelves and tables of the bedroom. Western books and pictures round out the cowboy motif. An old vanity and easy chair will please antique lovers. On cold winter evenings you'll appreciate the warm ambiance glowing through the glass door from the real wood fire. During summer, air conditioning keeps both rooms comfortable. In the private bath, a tub/shower is built right into the log wall. The living room/full kitchen is named for the ivy wallpaper that decorates the kitchen area. Two daybed couches make into four twin beds. An outdoor gas grill is also available. There is parking for 2 cars. There is satTV and a DVD player. If you like to hike, there are plenty of paths and riparian areas to explore at the bottom of the hill along Lynx Creek. Fishing is just a half-hour's hike down the creek at Fain Lake. Lynx Lake is larger and is just a few minutes drive into Prescott National Forest. It also has good fishing and row or paddle boat rental. Views from both rooms overlook Lynx Creek and the Bradshaw Mountains and are truly peaceful and beautiful. So come relax out on the deck and enjoy the views from the Chaparral Suite at Lynx Creek Farm. The Chaparral Suite is located in the Log Cabin at Lynx Creek Farm along with 3 other 1 bedroom accommodations that, all together, can sleep up to 14 persons in 4 kings and 6 twins. The Log Cabin at Lynx Creek Farm has 2 kitchens, one on each level, 4 full baths, 3 hot tubs on 3 decks, 2 wood-burning stoves, 4 satTVs/DVDs and plenty of parking.